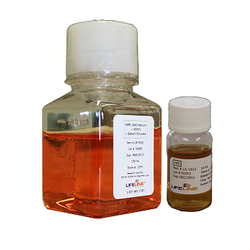 RPMI 1640 is used for the culture of human peripheral blood cells. RPMI 1640 supports the maintenance of these cells and proliferation in the presence of the correct supplements. RPMI 1640 contains no antimicrobials, since these components can cause cell stress and “masking effects” that may influence experimental results. Lifeline® offers these traditional supplements, however, they are not needed or recommended to achieve optimal cell performance. RPMI1640 is offered as a frozen basal medium extending shelf life and enhancing performance. RPMI 1640 Cell Culture Medium contains phenol red, 2 mM L-glutamine, 25 mM HEPES and 1 mM sodium Pyruvate. RPMI 1640 may be purchased separately or in a kit containing Fetal Bovine Serum (LS-1012). Lifeline® manufactures products using the highest quality raw materials and incorporates ISO style quality assurance in every production run. Exacting standards and production procedures ensure lot-to-lot consistency. Every production lot of RPMI 1640 Medium is extensively tested using endothelial cells. RPMI 1640 Medium + HEPES + Sodium Pyruvate with 10% FBS may be used for the maintenance of a variety of non-adherent cell types. Different supplements are required for proliferation and/or secretion of cytokines or antibodies. Different supplements are required for different populations of peripheral blood cells. Human Monocyte-Derived Dendritic Cells require the addition of growth factors for maintenance. Please see the Product Spec Sheet Human Peripheral Blood Mononuclear Cells, Human T Cells and Human B Cells may be stimulated with the growth factors listed below, but can be maintained in RPMI 1640 Medium + HEPES + Sodium Pyruvate with 10% FBS.